Visualise Your New Smile Today! Get a great smile in only a few months! From my experience, Dr ESS’s clinical skills and attributes as a dentist are excellent. I had extremely crooked teeth before and now they are perfectly straight thanks to his expertise. His communication throughout my treatment was clear and thorough, and he was always willing to answer any further questions that I had between my scheduled appointments. Richard was typical of my adult patients who wanted straight teeth but without fixed braces or any drilling of the natural teeth. The modern solution is Invisalign – a discreet tooth aligner system dubbed ‘contact lenses for teeth’. This case was done in 2003 and I have done hundreds of similar cases since. “I had always had a slight cross-over with my top, front teeth. However, by the time I reached my early forties, this was becoming much more pronounced. Apart from causing some discomfort, I was also becoming quite self conscious and would avoid smiling whenever possible. The prospect of two years of Invisalign was, initially, quite daunting. However, the process passed very quickly. Additionally, as obvious progress is made very quickly, the incentive and motivation to continue is very high. I was very nervous about doing Invisalign but after my first visit with Dr Stevenson-Smith I felt reassured and confident that i was making the right decision. 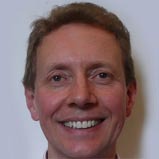 I had a fantastic result with Invisalign and the overall experience with Dr Stevenson-Smith was excellent.